Nov 6, 2012: I have written about a proposed extension to the CSS pseudo-classes used by HTML5 Forms in my later blog post CSS3 Pseudo-Classes and HTML5 Forms: Their Limitations and a Possible Solution. The webforms2 library supports these extensions, which may be of interest if you need advanced styling of HTML5 Forms that the specification doesn’t handle. 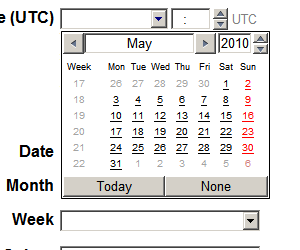 May 12, 2011: html5Widgets has been updated to support the oninput event. Aug. 6, 2010: An older version of this article was translated into Korean. Sept. 10, 2010: The webforms2 included with html5Widgets has been modified to fix validation issues with the newer versions of Safari and Chrome. Working example HTML5 Form using Modernizr, webforms2 and my new script, html5Forms. Go ahead … try them out. You know you wanna! Calendars, colour swatches, sliding widgets, client side validation: this is the nirvana that the HTML5 forms module promises. Some would say “So what? I’ve seen this on the web for years!”, and they’d be right. There have been some really brilliant people coding some really interesting widget and validation frameworks, so why should we change? It’s a W3C standard: so you know that it’ll work for years to come and if you have problems, you could always ask almost anyone in the web development community for help. Cellular phone support: HTML5 form fields will have optimized user interfaces appropriate for the type of device. Blackberry already has optimized versions of the date/time and color widgets and, according to Mark Pilgrim’s article A Form of Madness, the virtual keyboards that appear when using HTML5 form fields are optimized for the data being input. Web development tools will have to support it: It’s a safe bet that Aptana, Dreamweaver, and all the other IDEs out there will have HTML5 support. It’s HTML5: when you tell your non-techie co-workers that you use it, you will be the envy of all — after all, it must be five times better than regular HTML, right? Your boss will be so impressed that you are now a guru in this futuristic technology with a cool numbered acronym that he or she will give you a big fat raise!!! (Okay, okay. Don’t try to laugh too hard … your co-workers will start to worry). Unfortunately, today’s support for the HTML5 Form Module is spotty with each browser supporting different parts of the specification. Take a look at Wikipedia’s HTML5 Forms comparison chart. You’ll see each browser supporting a different set of features, but not one supports them all. But I Want To Use It Now!!! The pattern attribute forces the user to enter in a value using a specified format. It uses regular expressions to define this format. For example, if you want to force the user to input a U.S. Zip Code inside a form field, you would use the following markup. Note that required and pattern are independent from each other. You can have a pattern set on a form field without it being required (i.e. the pattern would only be checked if the user enters in data into the field). Opera 10+ (mobile and desktop editions) is the only browser that supports the validation routines natively. To use this in all other browsers, all you need is to include the following script tags in the head of your document. Note the data-webforms2-support="validation" in the script tag for html5Forms.js. This tells html5Forms to load Weston Ruter’s webforms2.js (which polyfill html5Forms validation. However, it only loads this script if the browser doesn’t support validation natively (The data-webforms2-support attribute can contain other HTML5 Form features in a comma delimited list, but more on that later). See an example of pattern and required in action. Note that the same validation framework checks the values of inputs of type email, url and number to ensure that the values are in their respective valid formats. As an added bonus, if you are using the iPhone or iPad version of Safari, the virtual keyboard that appears will be optimized for these type of form fields (e.g. when editing a number field, the keyboard that appears contains only digits and the “+”, “-“, and “.” keys. This is native behaviour for iOS, and I hope other mobile browsers, such the Android’s, follow suit. of the data to be input, if the field is required, etc). An example of placeholder text. The text disappears when the field has focus or if the user types information into the field. <input type="text" name="fullName" value="" required="required"
Easily my favourite of the HTML5 widgets, range gives developers a sliding control to put inside their forms. The min and max attributes contain the minimum and maximum values, and step denotes by what increments the range slider increments by when moved. Note that you can use these attributes with the number input type as well, but instead of having the fancy interface, it will use the validation engine to ensure the value follows what these attributes dictate. The contents of the output tag is the default value. Note the this.value syntax – I am not sure why the W3C HTML5 working group decided it was needed (why not just have the formula? ), but it is. If there are other types of expressions supported in the final specification, they are not supported by html5Forms at this time. Note that in order to apply CSS to the output tag in IE, it is necessary to use Remy Sharp’s HTML5 Enabling Script. See an example of the range input being used with the output tag. See an example of the output tag being used without a range field. 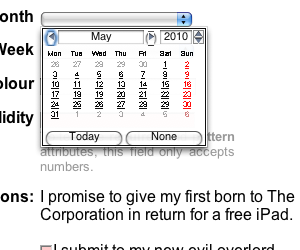 At the time of this writing, Opera is the only desktop browser that supports HTML5 date fields. To support the other browsers, html5Forms uses a slightly modified version of DynArch.com‘s Ex-“Coolest” DHTML Calendar (I decided not to use the coolest one because the Ex-Coolest has a more permissive license and it works really well). Now all browsers can support the datetime, datetime-local, date, month and week input fields, and submit these values in a consistent format. It looks like the native calendar for Opera for Mac is a smaller than the Windows version – hopefully this is just on my copy of the browser. 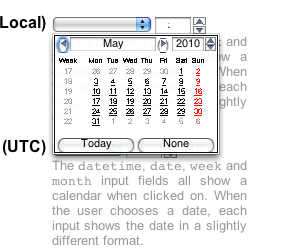 See the HTML5 date widgets in action. Note: In this example, The Opera Mobile Windows Emulator incorrectly displays the datetime and datetime-local calendars in the upper left-hand corner of the screen, but not the other ones. Since this is Opera’s own calendar widget, and not html5Forms’, this bug will have to fixed by Opera. Opera and the WebKit based Blackberry browser are the only ones that I know of that support the color input type. While we wait to see how the major browser manufacturers decide to implement color, you can use html5Forms’ implementation which uses Jan Odvarko‘s jscolor. 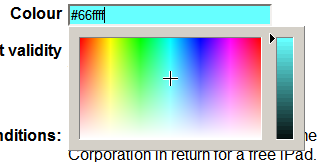 The script has been configured to allow only allow lower case hexadecimal rgb values to be entered, and that a blank value not be allowed, as per the W3C spec. Below is a comparison between the Blackberry’s implementation (grabbed from the Blackberry Development Blog), Opera’s and HTML5Widget/jscolor’s. How Well Do These Libraries Handle the Official Specification? However, the HTML5 Forms specification is large, and unfortunately, the libraries included in the html5Forms package don’t implement everything … yet!!!! Since I am really motivated with what HTML5 forms can do, I am committed to completing support to most, if not all, of the HTML5 Forms specification, and I have updated this package many times in the last two years. Support for other HTML5 form elements, among other things, datalist, number, keygen, time, meter and progress (If you want to polyfill the progress element, read my blog post Cross Browser HTML5 Progress Bars In Depth. Support for CSS styling of HTML5 form widgets as well as the ability to style form fields according to their validation state (e.g. :valid and :invalid psudo-classes). While html5Forms does not support the :valid and :invalid psudo-classes directly, form elements that use the polyfill can be styled to mimic that behavior. Please read my blog post Cross Browser Styling of HTML5 Forms — Even In Older Browsers for more information. Default styling for some of the new input types, like tel, email, url. Opera for Mac and Opera Mobile are the only browsers I know of that support this for email and url. Support for customizing the validation look and feel. This is one I would love to do, since I’m sure a lot of developers would want to change how validation errors appear on the screen. Unfortunately, the HTML5 specification doesn’t describe a standard way of doing this. Although there is not a common way of styling native implementations of the validation messages, it is possible to create a good cross-browser skin using the polyfill. Read Cross Browser Styling of HTML5 Forms — Even In Older Browsers for more on this. Support for internationalization of the error messages used in webforms2. This is not so important now that html5Forms supports setting custom error messages using the input tag’s data-errormessage attribute. Again, read Cross Browser Styling of HTML5 Forms — Even In Older Browsers to find out more. The webforms2 and html5Widgets libraries are designed to co-exist well with visibleIf to create interactive forms with fields that only validate the ones that visibleIf is displaying. Faruk Ates and Paul Irish for the definitive HTML5 and CSS3 feature detector, modernizr. Weston Ruter for doing the insane amount of work on webforms2 years ago. Brian McAllister: for making the excellent Unobtrusive slider control which I used for the range element. Mihai Bazon for keeping the The Ex-“Coolest” DHTML Calendar around even though he has a paid product. Jan Odvárko for his rocking jscolor widget. Remy Sharp for his fine HTML5 Enabling Script so we can force IE to style things like the output tag. Inayaili de Leon, Anne van Kesteren and Richard Bradshaw for allowing me to show how easy it is to make their original HTML5 Form demos work with html5Widgets. The W3C HTML5 Forms Specification Working Draft: The Working Draft is in “Last call for comments” status, so there may be some last minute changes. A Form of Madness: Chapter 10 of Mark Pilgrim’s great reference on HTML5. Download the latest version of html5Forms.js and all the cool 3rd Party scripts from github. I hope to translate this content for Korean Web Developers. Please feel free to! Please send me a link to the translated article and I’ll link to it here. Thanks in advance. 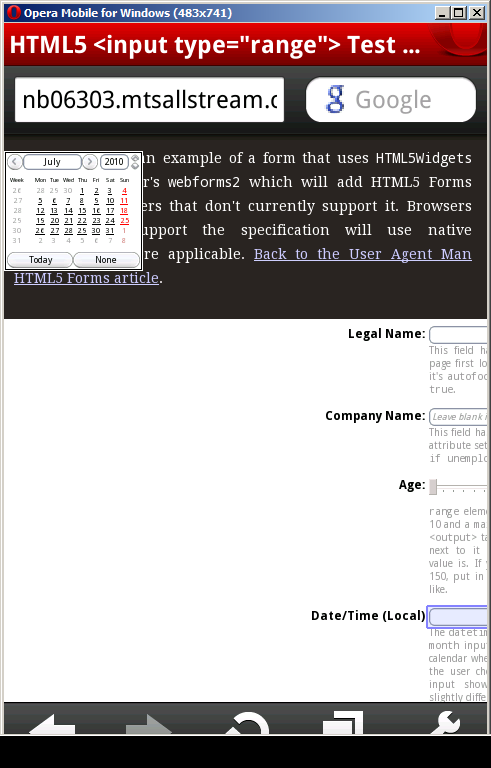 webforms2 and html5Widgets seem interesting – will check ’em out. @Pavel: Thanks for the bug report. The problem you describe usually happens when you haven’t included EventHelpers.js into the page. I did notice that in the archive, the example.html file had the script tags using absolute instead of relative URLs, which may have caused this problem. You can either change the URLs manually, or redownload the archive below to fix that issue. Please let me know if this is/isn’t the cause of your problem. @Colin: Thanks for the feature request (and yes, I love to do requests!). I have tried very hard to ensure the majority of the widgets are accessible (I am currently looking into adding keyboard support to the jscolor colour widget, which I believe to be the only one that doesn’t have keyboard support). I was lucky in that the frequency-decoder slider widget that is used for the range element already had keyboard support before I started working with it, but perhaps it is not working as expected in your work. If this is the case, please send me a URL with your example in it — I would love the opportunity to see what the issue is and, if it is a bug in the code, the chance to fix it for the benefit of everyone who uses the HTML5Widgets suite. As for the kitchen sink version of the script – it is something to consider, and although it may be overkill for the majority of uses (how likely wouild it be that someone would use all the widgets?). Maybe it would be cool if a base script was created that would analyse what page and then load only the scripts that are needed. @admin: I’ve been refering to the example on the top of this page – sorry, I forgot to mention that. The range demo in the download works just fine. 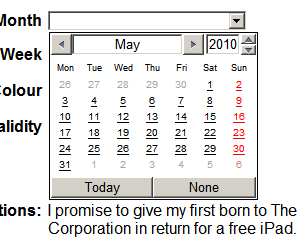 Date/Calendar emulated inputs – when the input does not have focus, upon gaining focus it correctly shows the calendar. If you want the calendar to show again, the focus event has to take place again – so you have to click outside of the input to invoke blur and the again click into the input. Minor “bug”. @Pavel: the date focus bug will fixed in an upcoming release. Thanks for sending me the information. This is great but, why not just use jquery for some of this? I’m really loving these tools. Soon as there is more support for IE I plan on implementing this in a modification for one of the online community software packages. The mod allows site administrators to easily create multiple forms to control how users format their input. I get a lot of requests to implement the functions that will be standard in HTML5, the package you have put together makes doing that a lot easier. I do have a question about the Date/Time (UTC) function. I’m not sure if there’s a bug where local time is being used or possibly the servers time is being used instead of true UTC. For instance I live in UTC-5 my hosts server is also in UTC-5, UTC-5 is displayed on the page rather then UTC. Assuming that server time is being used rather then true UTC. If my host was in say UTC-7, that would be displayed or should true UTC be displayed? Just wondering which way its supposed to work. It seems that an attribute PLACEHOLDER is not working for textarea, it only works for input fields (for browsers, that have no native support of this attribute). Is it possible to fix that problem? @Julia: Yes it is possible — I have just fixed it in the version on github! Please redownload and let me know whether it works for you or not. Thank you for letting me know about this oversight. Please let me start my thanking you for this excellent effort to bring html5 forms to the masses. I am using your script(s) to implement html5 forms. However I am still able to submit a form in IE9 eventhough one of the elements has no value and has gotten both the required attirbute and the pattern attribute. However when your code is done executing I find no onsubmit event handler attached to the form and I was wondering if this is supposed to be like this or not. Anyway would you please help me understand more of the way it is supposed to work so that I can figure out what is going wrong and that I can help you with an update for this. IE9 version 9.0.8112.12421 on Windows Server 2008 R2. I figured out the problem and implemented a quick hack around the issue. setTimeout($wf2.initNonRepetitionFunctionality, 500); //I am not sure what a sensible time is to wait. //but then how to deal with pages that do not have forms but do have this script running? I hope someone can point out a better way of handling this situation or that someone might have use of this. How would you recommend incorporating a comparison validation so that it behaves as the others do? Say for instance.. comparing password or email fields to make sure they are the same. One would obviously incorporate validation through regular expression on the main field. What about the secondary? You have developed an amazing tool Zoltan. Thanks. I have 2 queries. How do we pass the value for ‘data-webforms2-support’ attribute ?? 2) In the same HTML page I wish to use date and placeholder and color. Can I pass multiple values to the ‘data-webforms2-support’ ?? Chrome does not seem to support the datetime type, only the datetime-local and it looks nothing like your implementation. Is there a way to force chrome to use your datetime picker ? The only issue with using this option is that it also shuts off the iPhone’s native date-picker, which is more appropriate for mobile browsers. I will be looking into how to best deal with this use case in a future release. have you come up with a way to activate features without using the data-webforms-support attribute? i am using cake, and would like to use the builtin methods to include js, and they don’t provide a way to pass arbitrary attributes either. i have a workaround for cake, but i have found a real issue. your code doesn’t seem to deal with select’s with the required attribute under safari (maybe more, but that is where i ran into it). the submission is blocked (might be safari), but no popup to highlight what is needed.